Oskar Lindblom expects the Flyers' first three lines to be impressive. 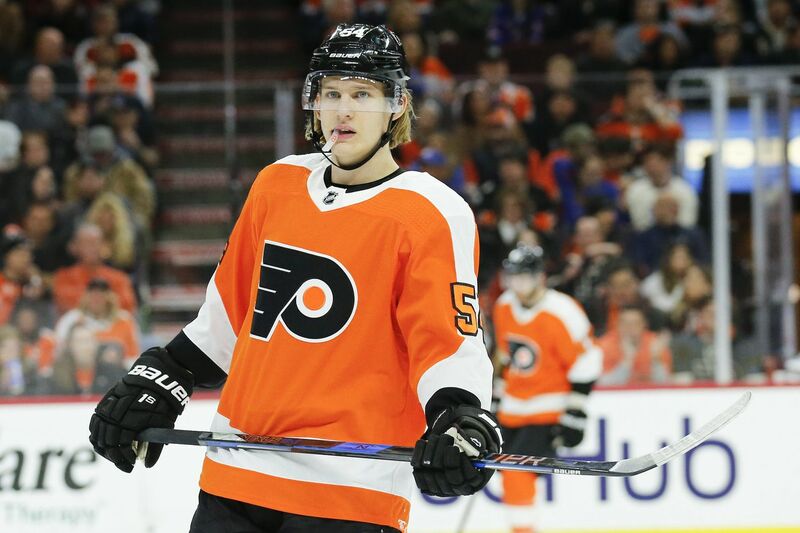 Oskar Lindblom is expected to play an important role for the Flyers this season, but the second-year left winger isn't taking anything for granted. The soft-spoken Sweden native says he has a lot to prove. "It's still a process," said Lindblom, one of the earliest arrivals at the Flyers' training camp, which starts Sept. 9 for rookies and Sept. 14 for veterans. "I have to do my best every day and show that I had a good summer. I have the same chance as everybody else has." On paper, Lindblom appears to be the Flyers' third-line left winger, behind scoring machines Claude Giroux (34 goals, 102 points last season) and James van Riemsdyk (36 goals). In the summer, the 6-foot-1, 193-pound Lindblom went home for a month before coming back to the area and training for two weeks. He then went home one last time for a brief stay before returning, skating and working out at the Flyers' practice facility in Voorhees. "It was a good summer," he said. With van Riemsdyk signed as a free-agent in the off-season, Lindblom figures to drop down in the lineup. He was asked if that would take some pressure off him to produce. "I don't know. My focus now is to make the team, then we'll see how everything else goes," he said. Lindblom, who turned 22 on Aug. 15, called van Riemsdyk "a really good player, someone I can look up to and learn a lot from. He works hard and is a good team player." In 2016-17, Lindblom was dominating in the Swedish Hockey League, collecting 22 goals and 47 points in 52 games and being named the league's top forward. He played solidly for the AHL's Lehigh Valley Phantoms last season (16 goals, 34 points in 54 games) before being called up to the Flyers and managing just two goals and six points over 23 games. "Smaller rinks, faster players," Lindblom said of the biggest change from Europe to North America competition. "It was good to play a couple months in Lehigh to get prepared for here." Lindblom, a fifth-round selection in the 2014 draft, said he got caught up too much in trying to make the team at the start of last season and is much more relaxed going into this year's training camp. In camp, he will be tried on multiple lines, but it wouldn't be surprising if he and right winger Wayne Simmonds begin the season on a unit centered by Jordan Weal or Morgan Frost. Frost could get a nine-game look-see before the Flyers decide whether to keep him or send him back to juniors. Center Scott Laughton, a first-round draft selection in 2012 who had 10 goals last season, is another player who will contend for a spot on that line. The first two lines could look like this at some point in camp: Sean Couturier, who is battling back from a knee injury but says he will be ready for the Oct. 4 season opener in Vegas, centering Giroux and Travis Konecny; and Nolan Patrick centering van Riemsdyk and Jake Voracek. The Flyers' top six look strong. If Lindblom and the mystery third-line center blossom, and Simmonds returns to form after an injury plagued 2017-18 season, they could have three extremely formidable units.